These two sweeties were in our office this morning: a Kemp’s ridley sea turtle and a loggerhead sea turtle. They were both found dead along the Nova Scotia shore of the Bay of Fundy. They are small—juvenile turtles—and they are something to see in person. I am struck by how delicate a turtle, despite its shell, can seem. How vulnerable. 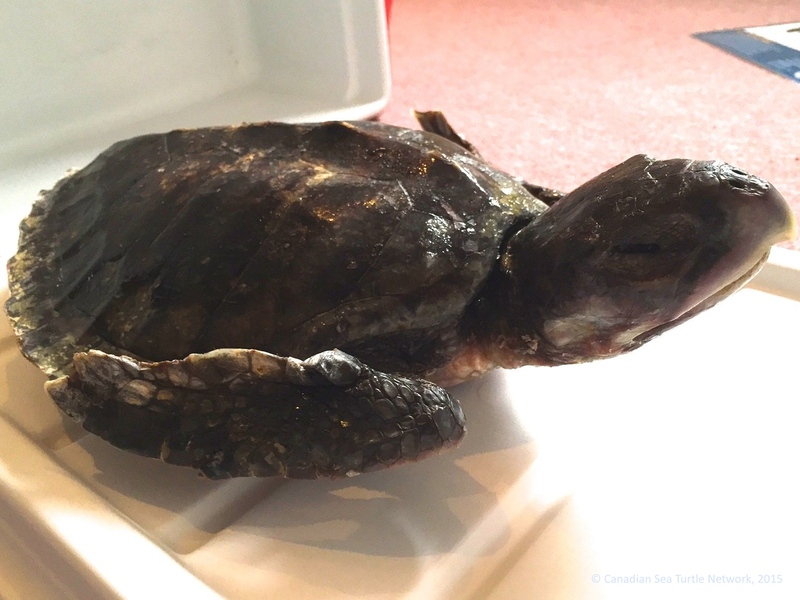 There are only a dozen Kemp’s ridley sightings on record in Nova Scotia. Kemp’s are considered the most endangered of the world’s sea turtles. And although we know we have loggerheads in Atlantic Canadian waters, it is rare for us to come across one this young. These little turtles are, of course, much, much smaller than a leatherback. Scientists measure sea turtles using their shell length, which we refer to as the Curved Carapace Length or “CCL.” The smallest leatherback turtle we have ever worked with had a CCL of just under 120 cm. This Kemp’s had a CCL of 27 cm and the loggerhead had a CCL of 24.5 cm. We won’t know for certain why these turtles died until our friend Dr. Pierre-Yves Daoust at the University of Prince Edward Island conducts the necropsy (which is like an autopsy) on them next week. But it is a safe bet that they died of hypothermia. Leatherbacks are able to withstand colder water temperatures than hard-shelled turtles (like Kemp’s and loggerheads) can. 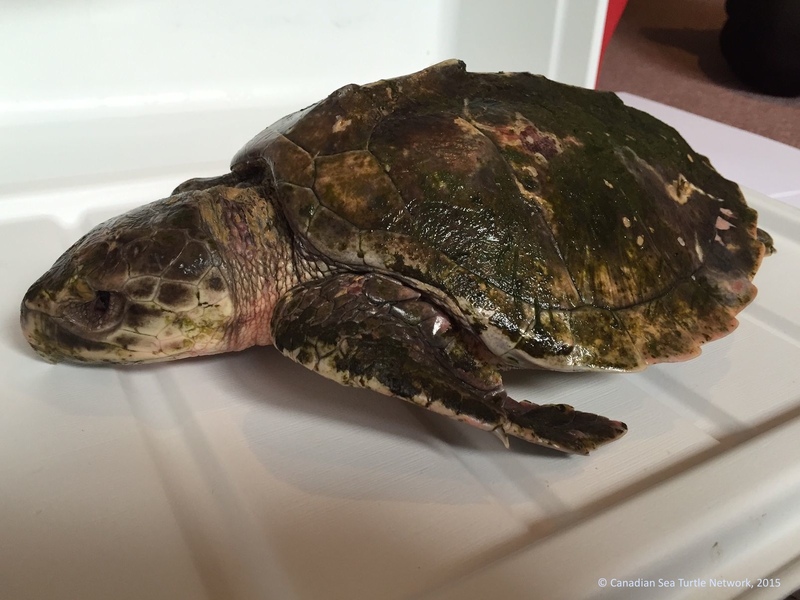 When hard-shelled turtles suddenly find themselves in cold water, they become “cold stunned.” If they are found soon enough they can survive. 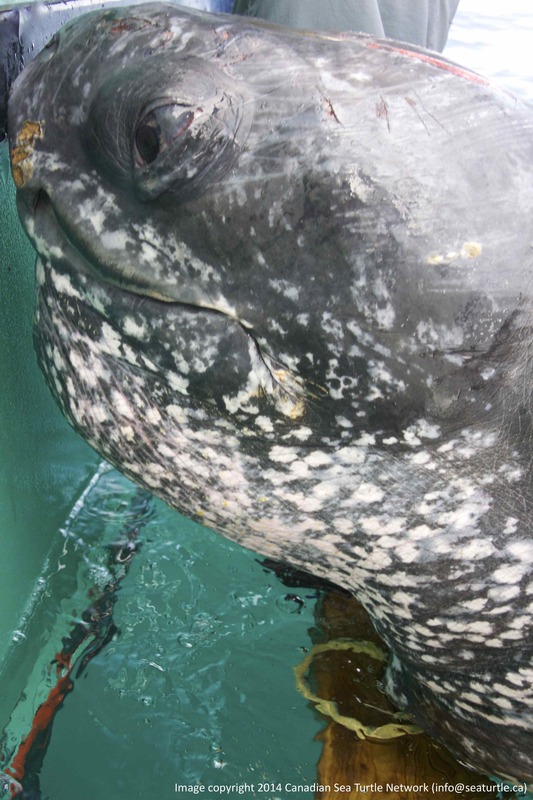 In November and December, sea turtles routinely cold stun along the coast of New England. Last year, there were an unprecedented number. The Kemp’s was found by Betty Kenneally. Betty walks the beach near her home four times a week. She isn’t patrolling for sea turtles specifically, but this happens to be the second Kemp’s ridley turtle she’s found and reported to us. The loggerhead was found by Carrie Dickie, who was walking the beach near her home. Her husband, Gerald Dickie, a biologist himself, carefully recorded all of the details of the animal for us. 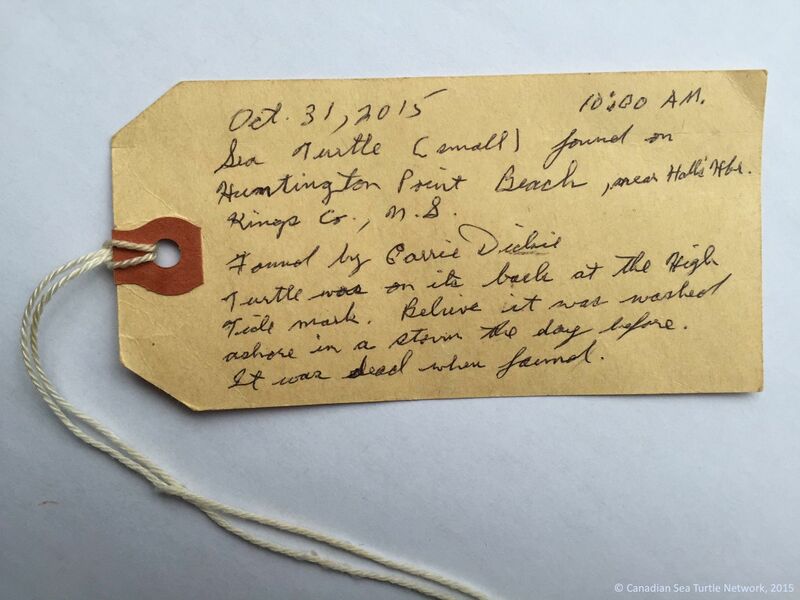 Gerald Dickie’s careful record of the loggerhead turtle Carrie Dickie found stranded on the coast of the Bay of Fundy in Nova Scotia. We are so grateful that they thought to call us. If you live in Nova Scotia and are interested in helping us patrol the beaches for these animals over the next six weeks, please email us at: info@seaturtle.ca. I’ve seen many dead sea turtles over the years. And each time I wish I could whisper a bit of life into them in the way one might be allowed in a Disney film. Something to make the heads lift up and the flippers move. Something that would allow us to send them safely back into the ocean. You know, of course, the story of Lily Rose, and why she is so special to us. But she thankfully got out and continued to swim down the coast of the United States. Riley was kind of like Beverly. We had tagged her as part of the Great Canadian Turtle Race, and she behaved differently from the rest of the turtles we were following that year. You can see her track below in red. And then after almost seven months of tracking, Riley’s tag stopped. So we are thrilled to hear about her and to know that she is safe and nesting—and we are also excited to learn where she is from, which we didn’t know when we tagged her! 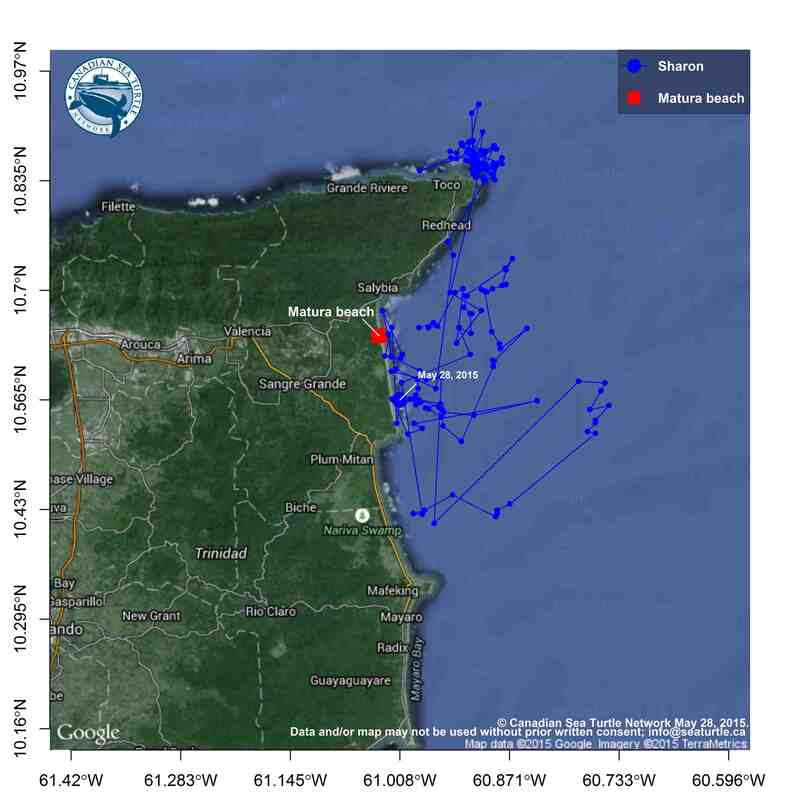 Below is an updated map on the turtles we’re following now. Beverly continues to entertain us with her track, looping around and down again now. But it’s Christie we’re watching most closely now. She’s still in the nesting zone. 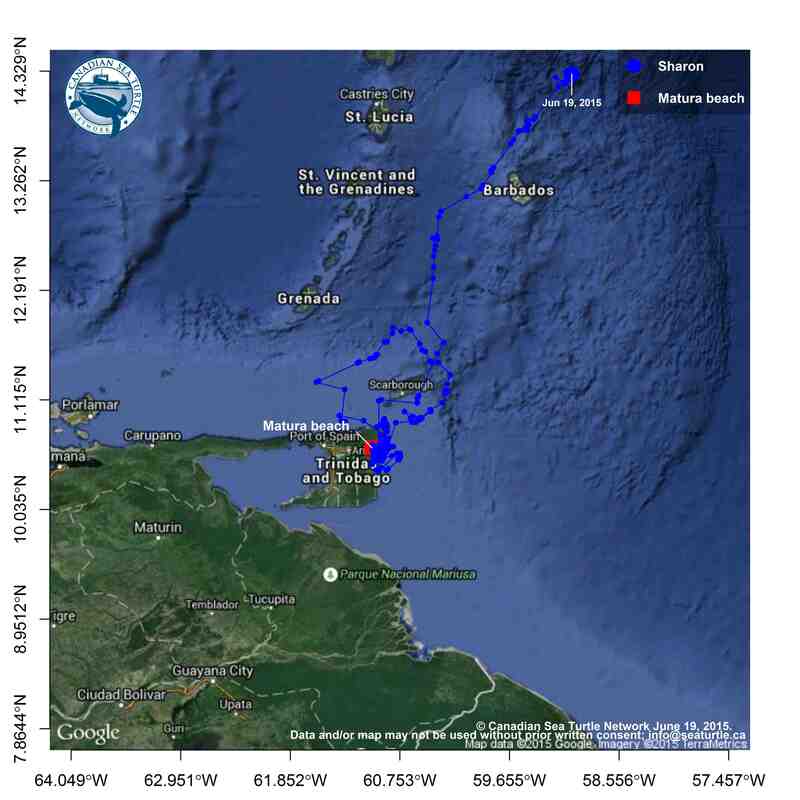 Her current location is off Toco point, which is a busy fishing area and the place where we lost contact with Peggy. Let’s hope she pulls a Riley and makes it through safely. I love days like today. 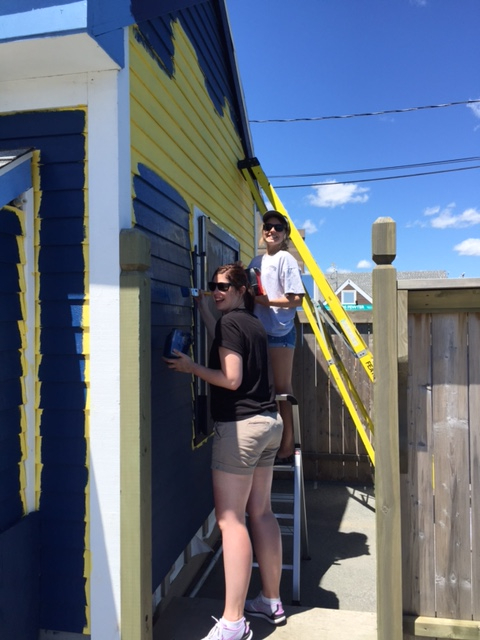 Today we are painting the Sea Turtle Centre. It was lemony yellow when we moved in. When we are finished, it will be leatherback blue. It is sunny and windy outside and the Halifax waterfront is full of people—tourists with cameras holding the hands of little kids sticky with ice cream. And locals, who are stretching their arms and legs out in the warm sun watching the clouds skitter by, knowing that this type of day is exactly why we put up with long, icy winters here. 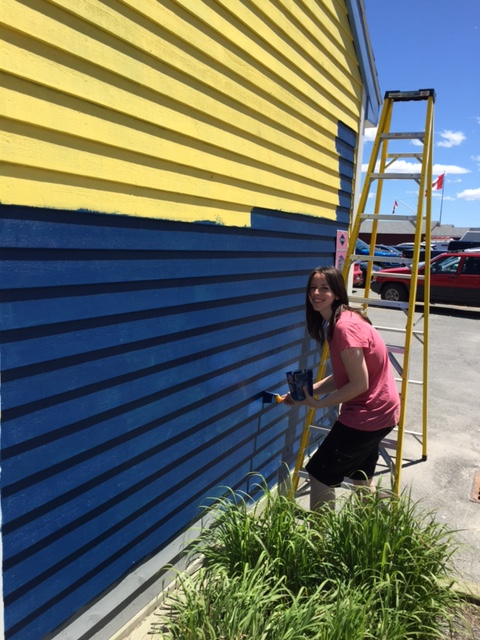 And at our Centre, there are lots of people painting, including volunteers like Lindsay (pictured above) and Laurel who have given up this first taste of summer after so much cold rain to join us. We even had a fisherman named Jake from Cape Breton who stopped by. He had his fishing pole with him, but since the mackerel weren’t biting down in the harbour yet, he picked up a paintbrush to help for a while. It’s the miracle of people working together to help sea turtles—what an honour and a joy to witness it! There have been a lot of developments at Matura Beach of late. We’ve been keeping a close eye on Christie and Sharon, our nesting turtles. As we found out when we tracked Peggy two years ago, there is no guarantee a leatherback will make it through the entire cycle of nesting safely. And this year, there has been an added challenge. 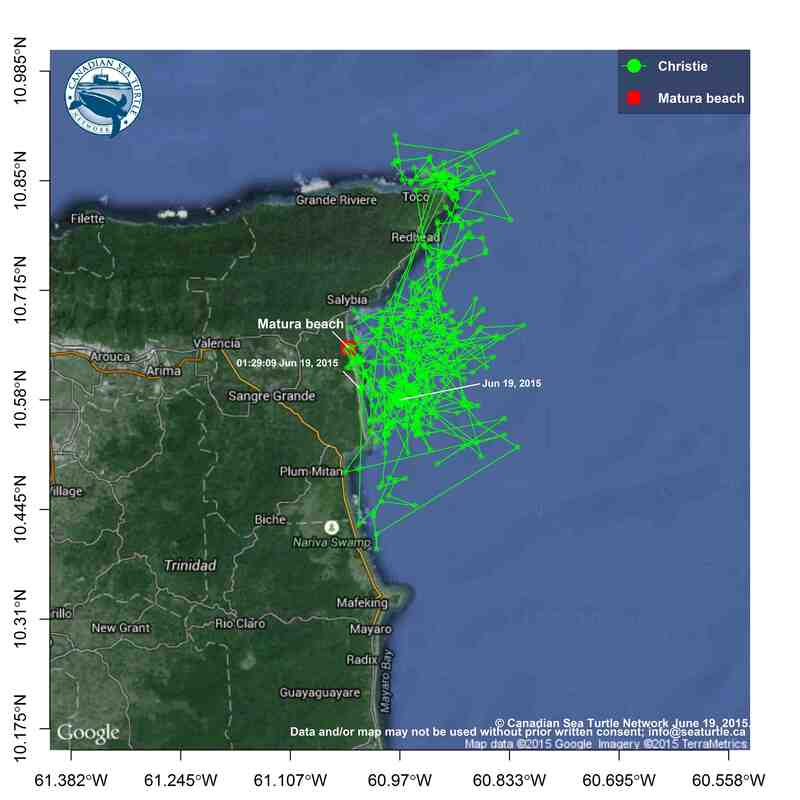 Sargassum in unprecedented amounts has landed at Matura, making it next to impossible for leatherbacks to nest there or for any hatchlings to make it to the sea. This is a video of our friend Kyle from the Nature Seekers. You will see him walk directly over the beach and almost 60 metres (200 feet) onto what is normally the ocean, but what is now a dense mat of sargassum. The next video shows how deep and strong the sargassum bed is as it withstands the slapping waves. So it has not been entirely surprising that neither Christie nor Sharon have been seen at Matura. 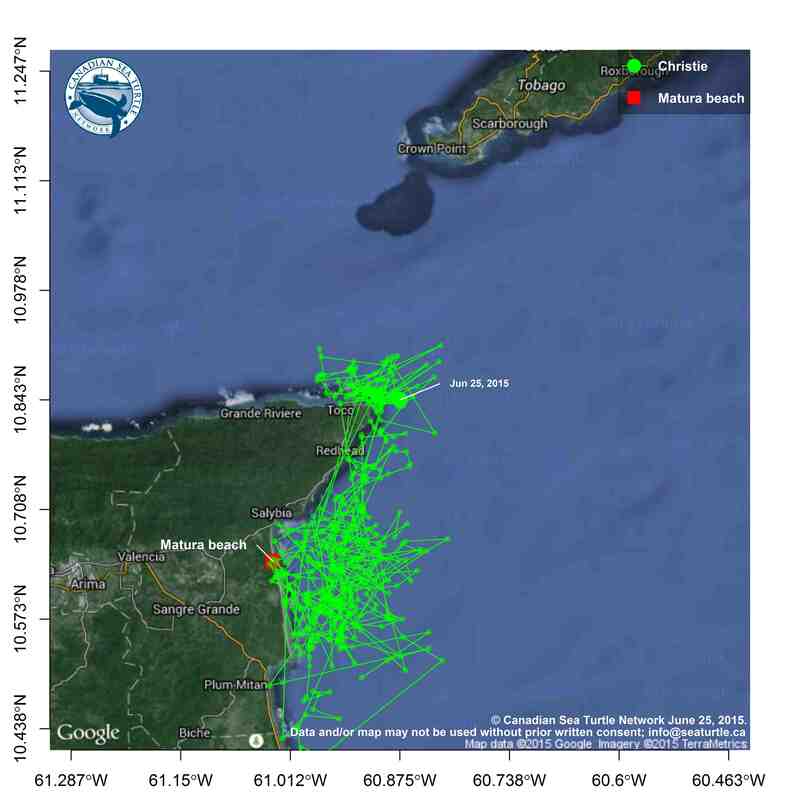 In good news, according to our satellite data, it seems that Christie nested last night. She landed a little south of Matura Beach at Fishing Pond. Sharon, on the other hand, has finished nesting. She is heading north! We are amazed at how quickly she is going. 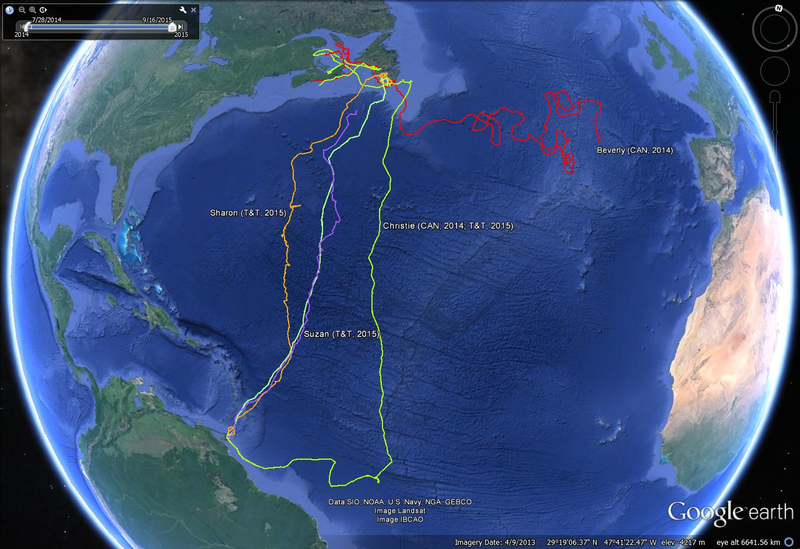 This is the first time we will have ever watched a known “Canadian” turtle on this part of their journey. We can’t wait to find out what comes next. Here is the larger map, where you can also see Beverly’s track. She’s going west—which may mean back toward us, ultimately. However, in what we might call typical Beverly style, she isn’t heading in a predictable way. You’ll note she’s swimming north at the moment. Sometimes I feel like Beverly’s our teenager-of-a-turtle. She’s endearing that way. 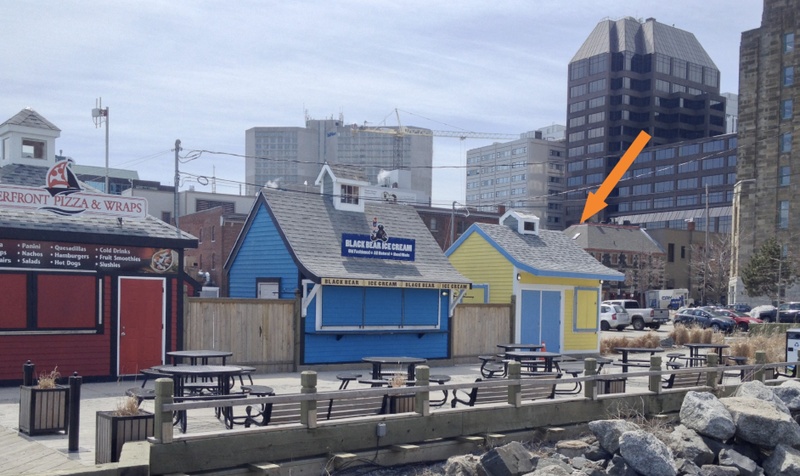 The Canadian Sea Turtle Centre is moving to the Halifax waterfront. 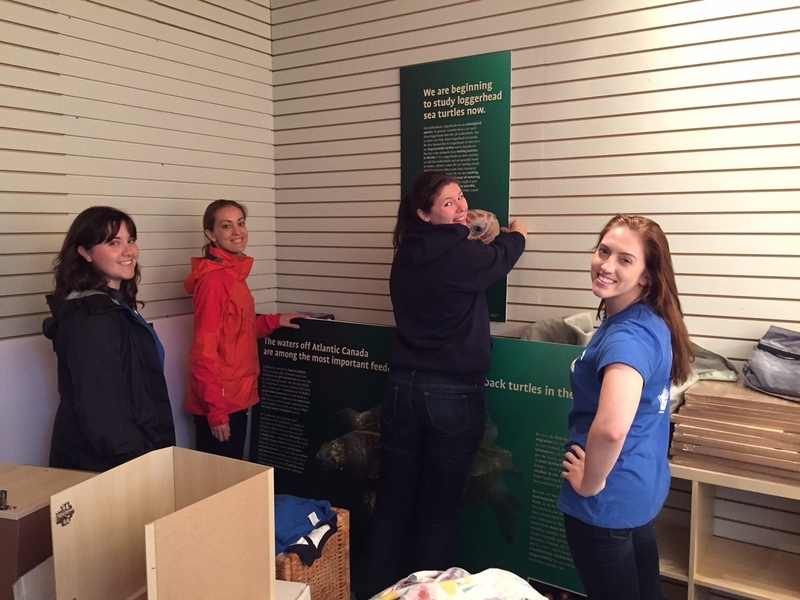 After two amazing summers at Peggy’s Cove, our educational centre is migrating downtown, where we will have the chance to talk turtles with even more people. 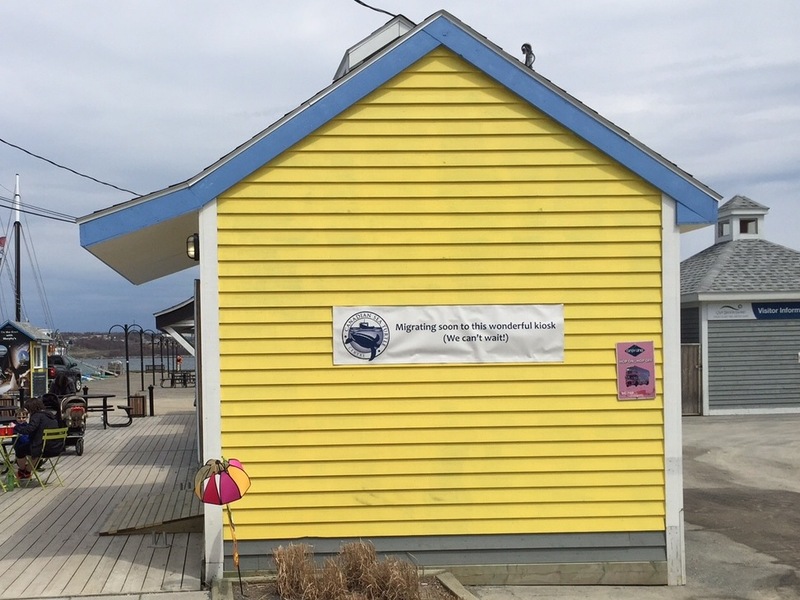 We’ve got great programs for people of all ages planned, including things like turtle crafts and games, interpretive talks on sea turtles, some hands-on jellyfish research, and real-time reports from the field boat. If you’re in Halifax, come and see us! We’d love to meet you. There is no charge to visit. Although there are still pieces to come to make our little space complete, we opened our doors today. We are so excited! First day! Alex, one of our amazing volunteers, is at the door. 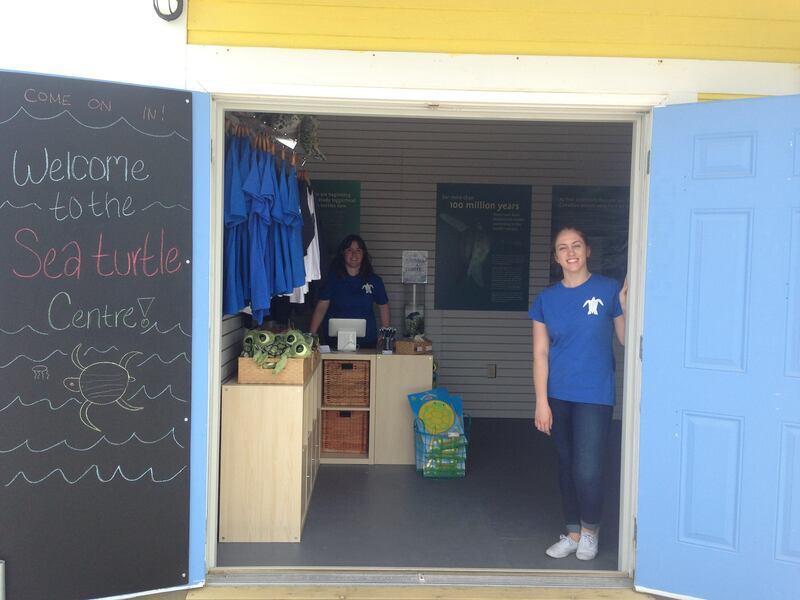 Emily, one of our sea turtle interns, is behind the desk. I should mention that BOTH of our sea turtle interns are named Emily this year. Emily F. is in this picture. Of course it took awhile to get the Turtle Centre together. Before you check out a few snapshots of the process, I have to mention the amazing people at Breakhouse, the design firm that has helped us pack our little space with tons of turtle information while making sure it is also lovely. I’ll be writing more about them and the other friends who have helped us in the coming weeks. Our temporary signage. The pink poster is for the Gray Line bus tour that drops off and picks up by our Centre. Hope that a lot of the passengers stop in! The walls inside the Sea Turtle Centre used to be bright yellow, like the outside. 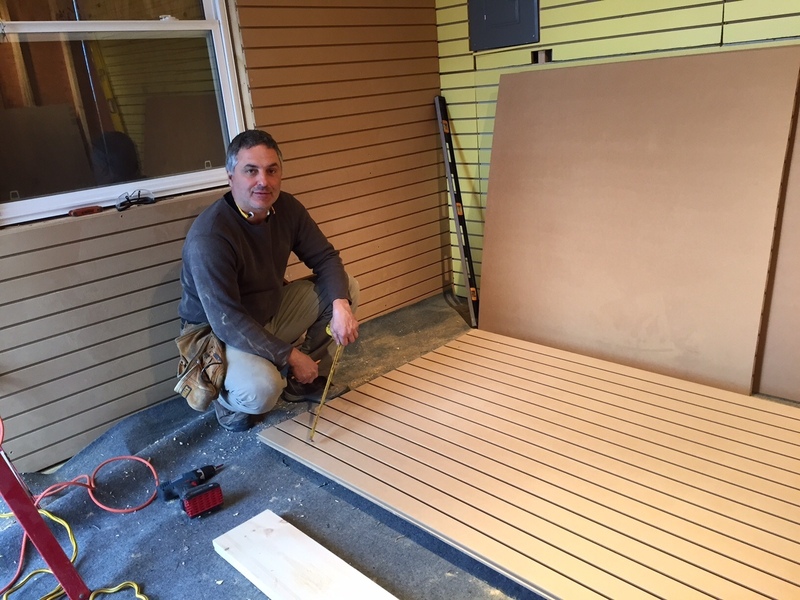 Theo, pictured here, is the person who helped us with all of our construction. Theo has been a longtime friend of the Canadian Sea Turtle Network, and when he’s not building houses, he is a fine actor, director and puppeteer. The office crew: Devan, Kayla and Emily B. (our other sea turtle intern). It bears mentioning that all three of them are scientists by training. 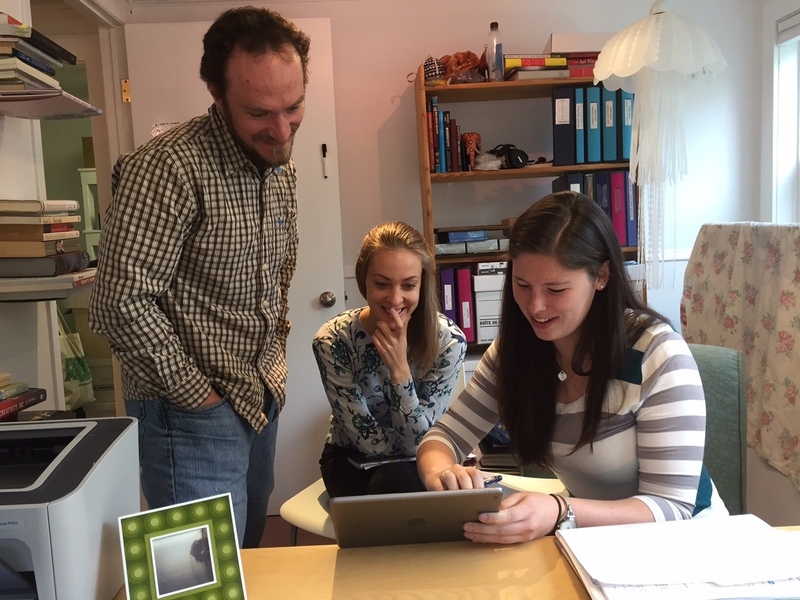 In this photograph they are geeking out over our cash register program and all the different ways it can present data. They truly appreciate a good spreadsheet! This is a photo of Kayla helping figure out how to set up our sales display. 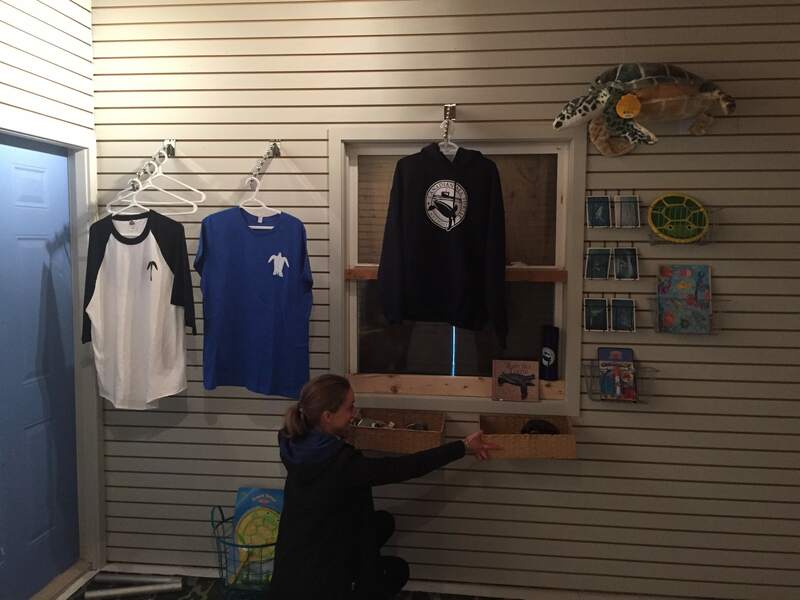 Kayla has been an amazing project manager for the Sea Turtle Centre–an impressive feat particularly because of the number of moving parts to this adventure. As you can see we are selling a few things at the Centre. 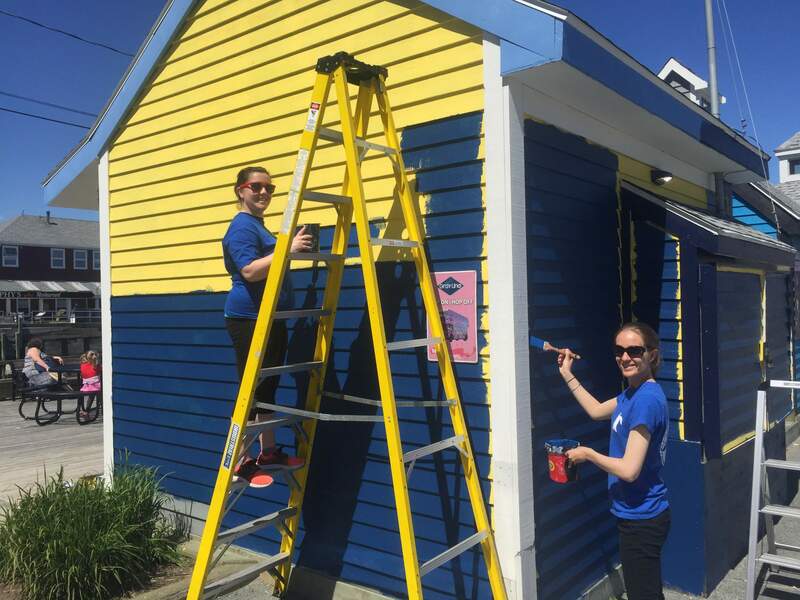 100% of our profits are used to help fund our research and community outreach programs. Emily, Kayla, Emily and Alex starting to work out the placement of our educational panels. What the inside looked like two nights ago…almost ready! Just waiting for the amazing, but more delicate, sea turtle specimens to be installed, like the bones of a leatherback flipper. We kept those items until the last so as not to risk damaging them. And now there are three turtles to follow again. 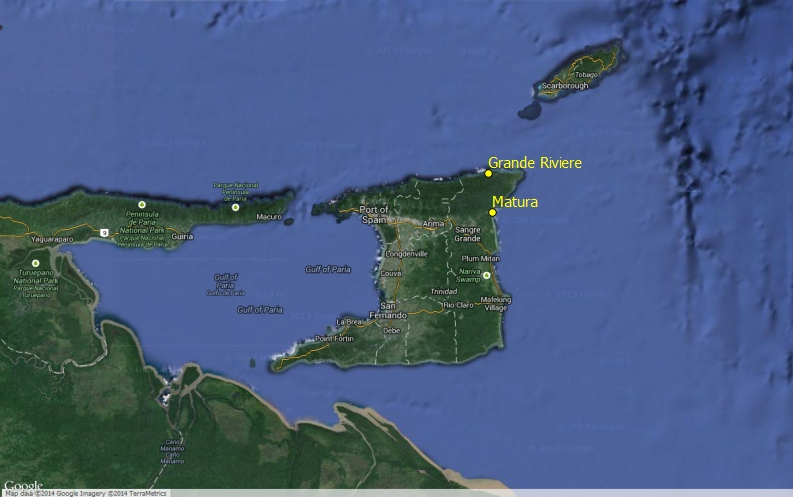 Our friends at the Nature Seekers satellite tagged another “Canadian” turtle at Matura Beach, Trinidad, that we have named Sharon. She is the blue dot, just below Christie’s green dot. Both turtles are hanging near the coast. 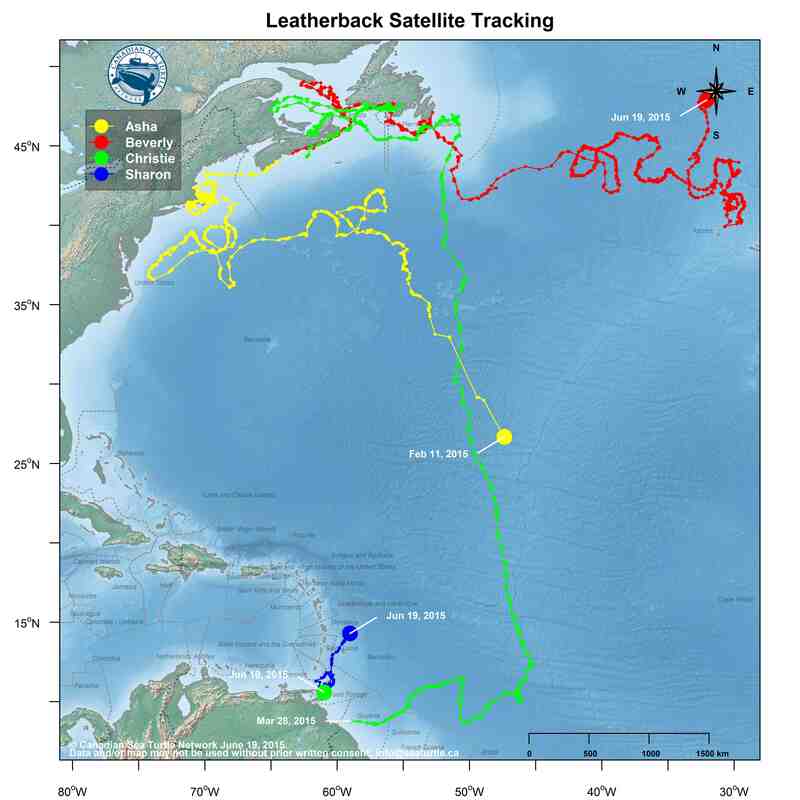 As you may remember, leatherbacks nest several times during a season. The days between each nesting event are called the “internesting interval.” During this time, while the next clutch of eggs is developing, the turtles are typically close to shore and within about 100 kilometers of their nesting beaches. The part about this normal behaviour that makes us uneasy is that the turtles’ chance of entanglement in fishing gear at this time of year is high. So we’re doing the only thing we can: crossing our fingers and hoping that Sharon and Christie stay safe. 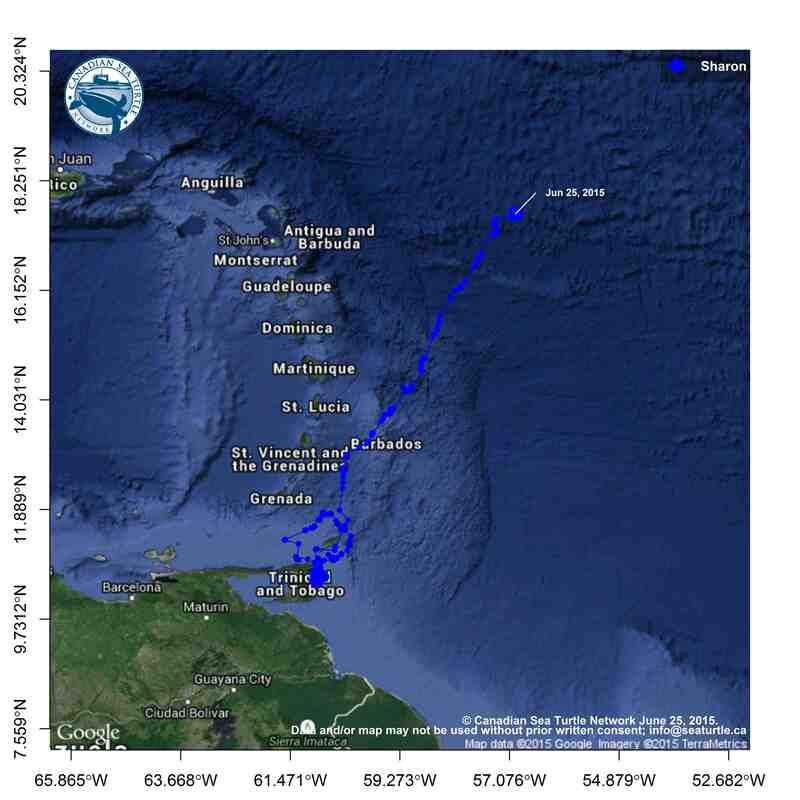 We’re also keeping an eye on Beverly, whom you may have noticed has turned and started swimming west again—perhaps on her way back home. 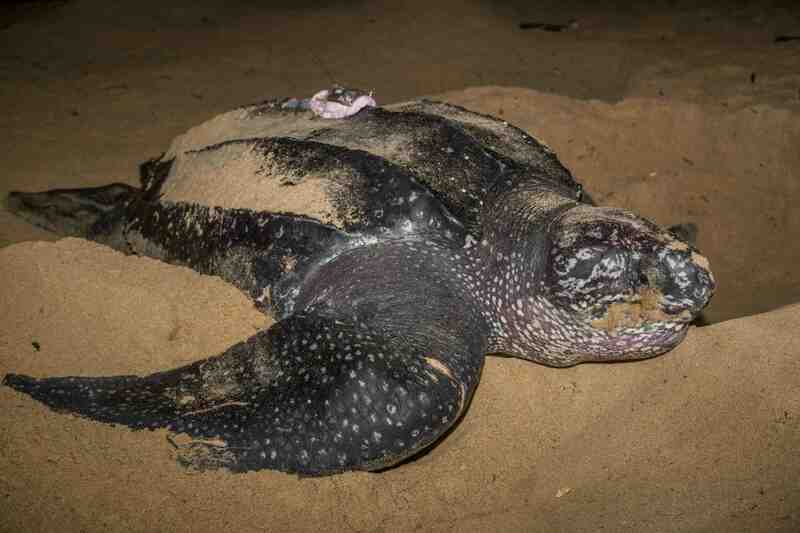 Christie nesting on Matura Beach, Trinidad, wearing her new satellite transmitter. Photo courtesy of Nature Seekers (natureseekers.org). The turtle phone rang at 12:30 this morning. It was Kyle, from the Nature Seekers in Trinidad. 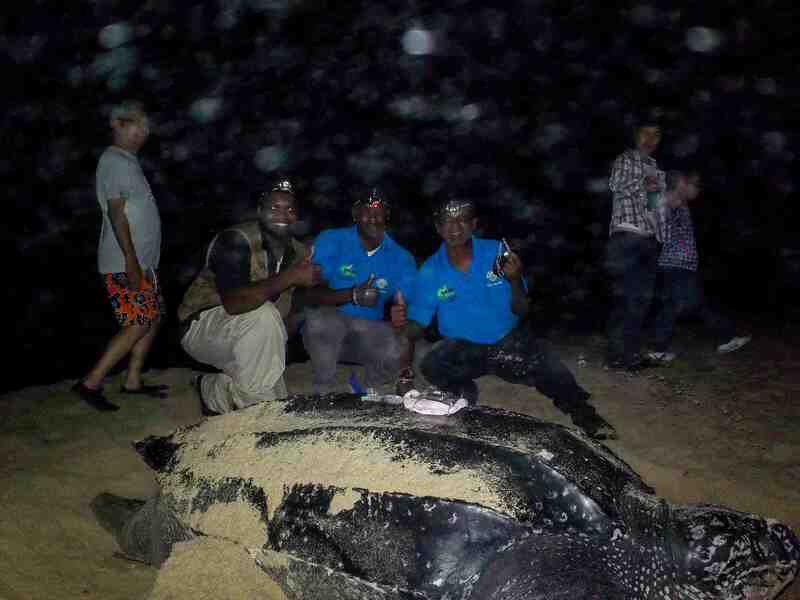 Francis, another one of the Nature Seekers, had been finishing up an ecotour with a crowd on Matura beach when he walked by a leatherback hauling up on the sand. One of the tourists asked how much bigger she was then the other turtle they had just seen nest. Francis went to check her out when he noticed she had a distinctive, transmitter-sized patch on the centre of the carapace. This patch is one of the things the beach crews in Trinidad were looking for. We have learned over the years, that when a transmitter comes off a turtle, the skin directly under it is light in colour. Within a few weeks, the skin will darken again. Francis raced to check the turtle’s flipper tags and radioed Kyle. “He read the numbers over the radio for me and BAM! It was Christie. That’s when we sprang into action,” said Kyle. And Christie looked good. The transmitter had clearly been knocked off—likely during mating. But that is just the start. 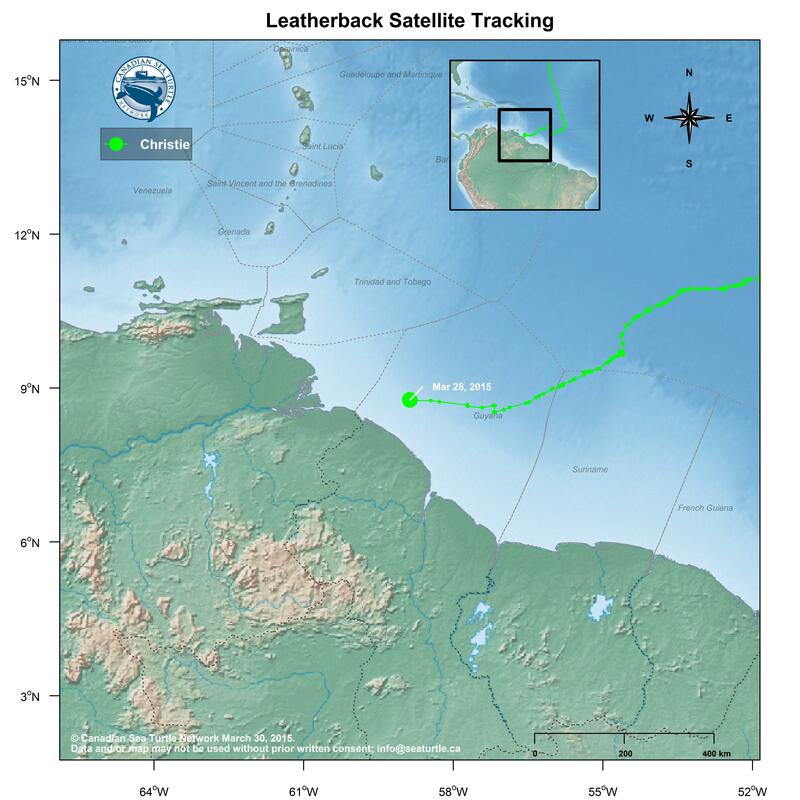 Some of our team went down to Trinidad two weeks ago to train members of the Nature Seekers in safely attaching satellite transmitters to leatherbacks. We wanted them to put transmitters on Canadian turtles so we could get the first leatherback satellite tracks back to Canada from the nesting beach. Kyle, Devin and Francis put one of those satellite transmitters on Christie. Our goal is to watch her swim back home to us again. When something like this happens it is hard to explain how slim the chances of it are. It’s miraculous. We are thrilled. And so proud of our friends at Matura. What a team! Kyle, Devin and Francis with Christie. Photo courtesy of Nature Seekers (natureseekers.org). Christie’s tag stopped transmitting on Saturday. We are so disappointed. She was just 300 kilometers away from where we expected her to nest. She had logged approximately 11,500 kilometres since we tagged her. 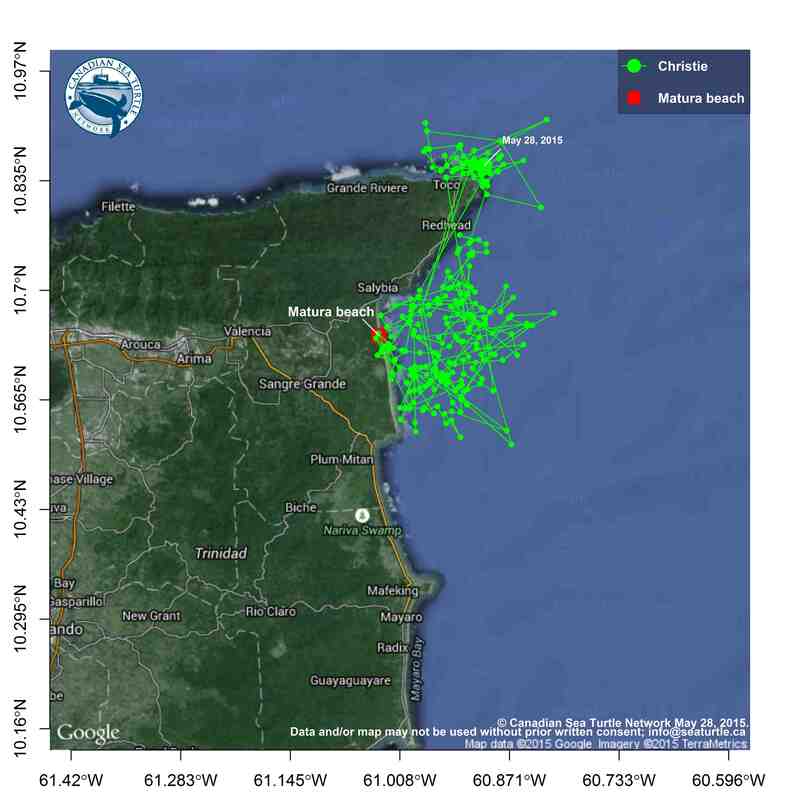 Data from the tag on March 28 showed that she was diving normally and that the tag had plenty of battery. But, as you may remember, Christie had just started onto the shelf waters, a place where we know leatherbacks mate. It is our best guess that a male turtle damaged the antenna of the transmitter or knocked the tag off her altogether. There is also always a possibility that she was caught in fishing gear. If indeed, as we hope, Christie simply lost the tag mating, then we will keep our fingers crossed that someone finds our turtle when she eventually hauls up on the nesting beach. She should still have her flipper tags safely in place as well as her microchip. And there is a chance that her transmitter is still on. If that’s the case, the transmitter can be recovered—along with all of the important data it contains—if someone finds her. This happened before in the amazing story of Red Rockette. So we remain cautiously optimistic. But we will miss following her movements. Christie was a bright spot in our days as we checked always with excitement to see how far she’d travelled. What a privilege it was to watch her remarkable journey (11,500 kilometres!!) up close.